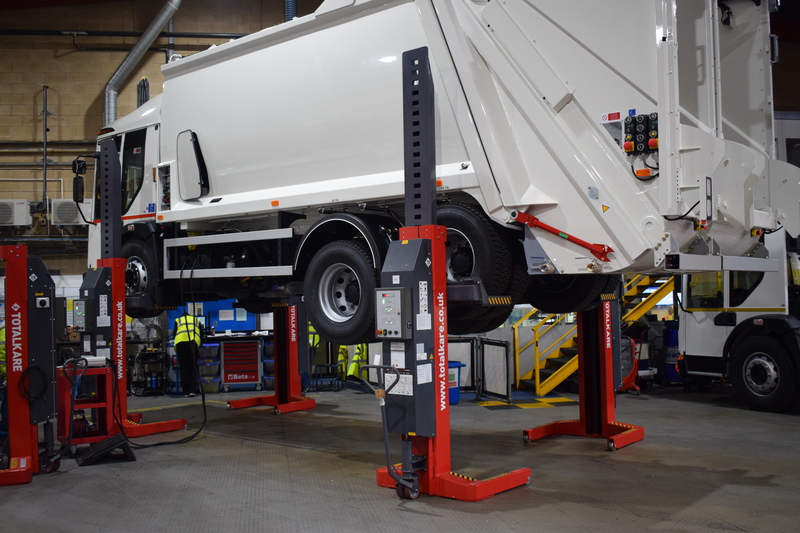 Dennis Eagle, leading manufacturer of recycling vehicles, has extended its commitment to quality in manufacturing by investing in its production line with three new sets of T8DC cable-free mobile column lifts from TotalKare, the UK's number one provider of heavy-duty vehicle lifting solutions. The production line produces up to 24 vehicles per week at Dennis Eagle's Warwick headquarters and the new lifts from TotalKare are used in the PDI area at the end of the production line to carry out quality inspections before despatch to customers. The lifts are in constant use with a new vehicle entering the PDI area every one and a half hours to be inspected. Duncan Curtlin, manufacturing quality manager at Dennis Eagle, says the new cable-free lifts are ideal for the production line because of their excellent manoeuvrability and elimination of trip hazards due to the cable-free technology. Also, the adjustable wheel forks allow the company to lift vehicles of all sizes coming off the production line. The lifts also help to speed up operations and allow full access to vehicles to carry out pre-despatch inspections. The T8DC lifts from TotalKare have a lifting capacity of 7,500kg per column and can be used in sets of four, six or eight as required. Their full compatibility with each other offers users true flexibility. Says Duncan Curtlin: "Our past experience with TotalKare - offering us great service levels and an all-inclusive lease hire package - made it a simple choice for us to choose them as the supplier of our mobile column lifts. The process was straightforward from beginning to end." Brian Young, National Account Manager at TotalKare, adds: "We are seeing more and more of our customers choosing a lease hire option when investing in capital equipment. Lease hire allows customers to know their monthly costs for the next five years with no worry of unexpected bills coming into the business and the option of purchasing or replacing the lifts with new equipment at the end of the contract." Caption: Dennis Eagle improves production line inspections with TotalKare cable-free mobile vehicle lifts. Formerly known as SOMERSTOTALKARE, TotalKare is the UK's number one supplier of heavy duty vehicle lifting solutions and aftersales care. 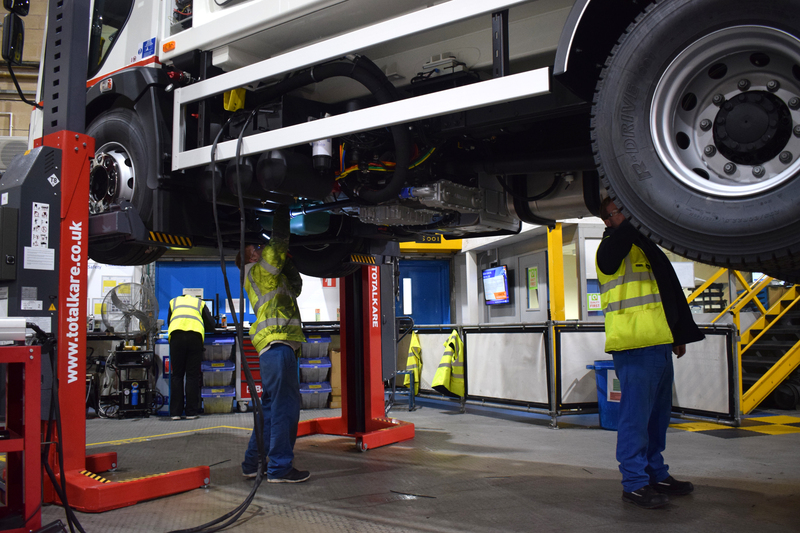 The company has been supplying heavy duty vehicle lifts to the UK market for over 30 years, providing multi-national operators and independent workshops with more than 6,000 sets of mobile lifts. TotalKare also offers ancillary equipment, operator training and various financial options to suit every kind of business and budget.